LG Optimus Me P350 is the latest entry-level Android smartphone from LG. The phone is aimed to those who tight of budget. The device is being designed to run on the Android 2.2 Froyo platform and ability to access Android Market for music, games and other entertainment applications. The power of the entry-level smartphone is booted up by 600 MHz CPU. 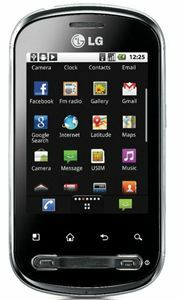 Featured with a 2.8-inch TFT capacitive touchscreen which operates at 320 x 480 resolutions, the LG Optimus Me P350 is also equipped with a 3-megapixel camera with auto-focus, geo-tagging and video recording functions. It boasts with an accelerometer sensor for UI auto-rotate and proximity sensor for auto turn-off, supports HSDPA and Wi-Fi, integrated with A-GPS, stereo FM radio with RDS, 3.5mm audio jack and 140MB of internal memory, and comes with a 1280mAh Li-ion battery that provides up to 450 hours of standby time and up to 5 hours of talk time. In addition, it is Bluetooth enabled and supports mircoSD memory card. Available in five vibrant colors such as natural silver, micro titan, aqua blue, powder pink and glamour red, the LG Optimus Me P350 is expected to be available in February in Europe for the estimated price of $200.